Looking back can be a great thing – it helps you remember the good times, see how far you’ve come, and calculate exactly how many years the dubious outfits your parents dressed you in as a kid added onto your therapy bill. So, to celebrate the new era of our sponsorship deal with Sale Sharks, we’re dipping into the video vault, going back in time and behind the scenes on our visit to Sale Sharks’ training ground. You might have heard that we’ve just signed a deal to become the new sponsor of Sale Sharks, which is pretty flippin’ ace. What makes this story even more emotional though is that we originally joined with the club back in 2010, which is the digital equivalent of 3.256bn light years ago, before a few years’ hiatus. But – as absence makes the heart grow fonder – we’ve been reunited and are now the club’s newest sponsor! 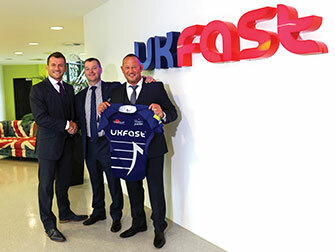 During our time with the Sale Sharks, UKFast’s sponsorship was instrumental in growing the fan base at Edgeley Park to more than 10,000, alongside Nathan Bombrys, who’s now Managing Director of Glasgow Warriors; so we’re expecting big things this time around too. During our visit in 2010, we go backstage to the Sale Sharks Insider Suite, where local business leaders are invited to participate in exciting corporate training days, coached by Sharks’ very own team of experienced and dedicated personnel. Watch the vid for exclusive insider perspectives from world-class players like Charlie Hodgson and the director of rugby, Philippe St Andre. Sign up to the UKFast YouTube channel to make sure you never miss a trick with all the latest news and insights from our film team!